As far as frustrating weeks go, winning more than £300,000 in prize-money is at the better end of the spectrum, but when it is a Royal Ascot winner you are after a string of near-misses can grate. William Haggas had as good a royal meeting as it is possible to have without a winner, saddling three seconds, a third and a fourth. Just two of his 16 runners registered a finishing position in double figures. "We had a good week, but it was a very frustrating week. 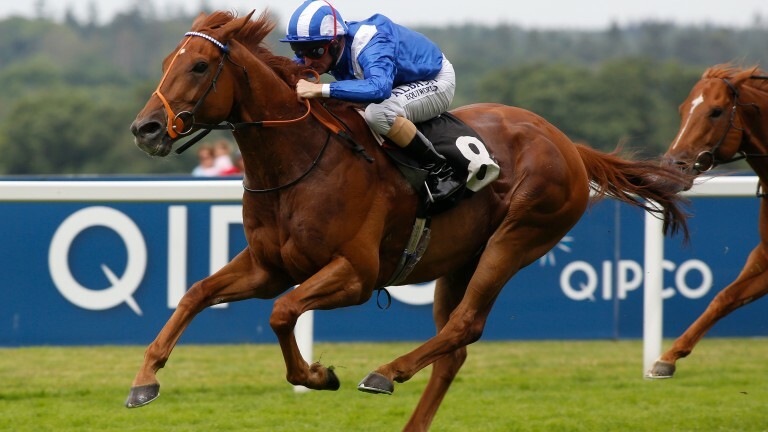 We were fourth top earner – we won £300,000-plus – but we didn't have a winner," said Haggas. "I was very pleased with the horses, they ran really well." Among Haggas's seconds were Headway, who won the race on his side in the Coventry, although the trainer concedes was beaten by a better horse on the day in Rajasinghe, Mutakayyef, who found only Europe's best miler Ribchester too good in a furiously run Queen Anne, and Tasleet, who was involved in the argy-bargy at the end of the Diamond Jubilee. The good news for Haggas is that, with a stable full of horses capable of being competitive on the most hotly contested cards of the year, he has plenty to get excited about. The usual caveat of "I need to talk to Sheikh Hamdan and Jim Crowley to see what they think" is still applied, but in his own mind he is already forming Group 1 plans for his two stable stars. "Tasleet's in the July Cup, but I don't know if we'll run, I've never thought Newmarket's his place – certainly the Rowley Mile," said Haggas of the Group 2 Duke of York winner. "He might well go as he needs to run in a Group 1 and that's the obvious one. There's not many options and for a sprinter he is relatively lightly raced, but he could go for the Maurice de Gheest. "His two races in my opinion are the Haydock Sprint Cup and the race on Champions Day. He's clearly shown he can go on any ground now, so I want to keep him fresh for those two races at the back end." On Mutakayyef, he added: "He has lots of options. We could go back to a mile and a quarter for the Juddmonte again, I've always harboured a desire to go for the Sussex with him and he could go back to Ascot for the Summer Mile again. "He's in good shape and he needs racing, he hasn't had much of it. We've got lots of options with him but he needs firm ground so we'll be guided by that."